New York City Ballet interrupted its regular repertory programming in this Winter 2017 season to present fourteen performances of The Sleeping Beauty. It’s a testament to where this company now is that these two weeks transcended the contemporary magic of the production, converting it instead into the equally magical sight of NYCB’s plethora of talent in what seemed like an endless procession of role debuts. The company’s abundance of exceptional young dancers now seems to overwhelm – in a good way – available casting opportunities. It’s tempting to focus on these rising young dancers in every review, but in this instance, the nature of the production itself and the quality of the performances by the two lead ballerinas I was able to see – Megan Fairchild’s very fine Aurora on February 9th, and Lauren Lovette’s memorable debut in the same role one week later – must push a further discussion of NYCB’s embarrassment of riches, as significant as that is, to a less prominent position. 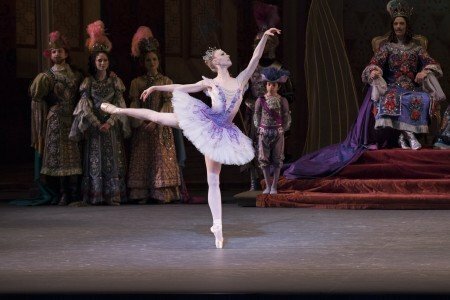 The Sleeping Beauty is a tough ballet – not just for dancers, but for audiences. It’s a classic story ballet – aside from Swan Lake, maybe the classic classical ballet. In addition to the opportunity to see fairytale sets and costumes, original or updated, there’s the Tchaikovsky music, a wicked fairy, the lovely Garland Waltz, the final romantic Grand Pas de Deux, and the Rose Adagio, for which the audience always holds its collective breath. 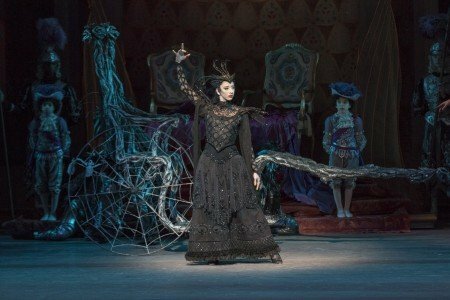 But sometimes Sleeping Beauty productions can be more fidelitous to the original staging, choreography and costumes than some audience members (probably more than critics) can handle, and sometimes it’s filled with more gimmicks than some critics (probably more than the audiences) can handle. And in most productions, the visual exposition moves forward slowly and deliberately, like molasses – as if one were visually immersed in a storybook and had the luxury of allowing oneself to become submerged in the experience. This might have been perfect for a late nineteenth century audience when the Petipa-choreographed ballet premiered, but can be soporific to an audience in the twenty-first century. And then there’s NYCB’s production, choreographed, after Petipa, by Ballet Master in Chief, Peter Martins. It’s anything but ponderous: on the contrary, this version moves at a feverish pace. Befitting the company that Balanchine built, non-essential sub-storylines and accompanying choreography have been stripped away, and what I’ve described as Petipa “dead-spots” and overly-milked bows have been eliminated. But very little of Petipa’s essential choreography for Aurora or the Prince has been jettisoned. All that really matters is there. While this version, unlike NYCB’s iteration of Swan Lake, is of the fairytale period (or close enough), sometimes Martins goes too far – or doesn’t go far enough. The production at times moves too fast and cuts too much, limiting opportunity for the characterization and the fun – as with the scenes involving Carabosse. And although having the Prince’s journey to the castle interrupted by the lone intermission works for me (and appeared to for the audience), it results in a test of the ballerina’s stamina far in excess of what’s usually required, and produces exceptionally long lines at the restrooms. In the other direction, including a variation for the Lilac Fairy in the wedding scene (here Act II, Scene 2) looks superfluous, and the journey to the castle still takes too long – although it’s now after intermission, with the audience less antsy. 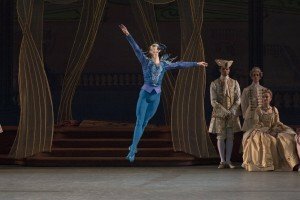 But generally, I like the pace quite a bit – for the same reason that I like Kevin McKenzie’s current version of Swan Lake for American Ballet Theatre, despite what some consider to be unwise cuts in the last act. Like that production, here the tonnage moves, and with a contemporary sensibility. The elimination of dull patrician dances and most of the “hunt” scene (here scene 3 of Act I: The Vision) are plusses to everyone except purists who insist on having classical story ballets presented the way they’re “supposed to be”. Indeed, having the Prince somewhat contemptuously toss aside the offered blindfold (to begin the game of blind man’s bluff that’s included in extended-play versions) may be seen to represent Martins’s attitude toward the way things are supposed to be. 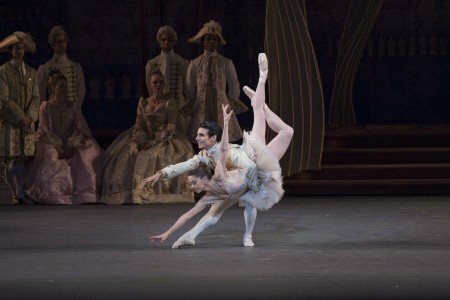 But regardless of the production’s peccadillos, it’s the quality of the lead ballerina that dominates the memory. Fairchild’s Aurora was very well done. She executed brilliantly, with not a mistake I could see, and her flawless Rose Adagio included solid, extended balances that displayed her unexpected (to some) strength. Beyond technique, there’s an innate sweetness to her stage persona that’s disarming, and refreshing. She’s the Aurora next door. But for a fairytale princess and soon to be queen (in this production), you expect something more. 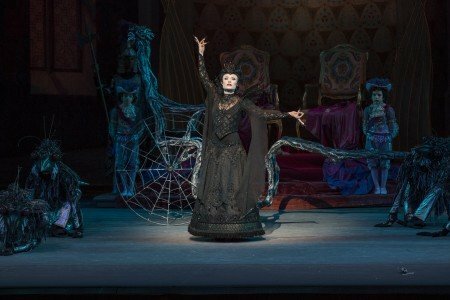 As finely as she executed the role, that quality of excitement that prompts an audience to vicariously jump the proscenium and join her on stage isn’t there. Indeed, despite what I saw as a credibility issue (my prejudice, as I’ll discuss further below), her Prince Desire, Joaquin de Luz, was more exciting to watch. And with rare exception, there was precious little phrasing (a component of that lack of excitement). I chalked this up initially to the pace of the production, but, as other Auroras have demonstrated, that’s not the case. And her facial expression varied little, making the performance look somewhat mechanical. Particularly annoying to me was Fairchild’s tendency to open her mouth when she completed a phrase. This wasn’t nearly as pronounced as I’ve seen done by others, where it looks like the ballerina is baying at the moon, but it seemed to be present all the time. At first I thought this was Fairchild’s way of portraying a 16 year old’s joy at being the center of attention, which would have been understandable (although there are many better ways to convey that sense), but it didn’t change – it was evident in the Vision scene and the Grand Pas as well. It makes the portrayal look artificial, even when it is well-executed, as it undeniably was here. But there was nothing whatsoever artificial about Lovette’s debut as Aurora. In January, 2011, after seeing a “new” corps dancer for the first time, in Christopher Wheeldon’s Polyphonia, I wrote “Ms. Lovette was not only technically accomplished, she was strikingly expressive without being the least emotional or melodramatic. It was an unexpectedly exceptional performance, that was well-received by the usually restrained NYCB audience. Ms. Lovette appears small and pretty enough to be a cute soubrette, but she also appears to be talented enough to be a lot more than that.” Sometimes, you just know. Since then, the superlatives just kept on coming. 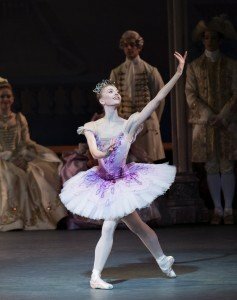 But as fine as some of her other debut performances have been, this one took her accomplishments, and her stature, as NYCB’s newest principal ballerina to another level. While it may not have been perfect, whatever that might be, it seemed uncannily close. And it’s not that she did it; but how she did it. First the criticisms, which aren’t really criticisms. Lovette seemed to me to hold back a bit; to be careful, particularly in Act I. In her jumps, for example, she seemed to have more difficulty getting off the ground than she usually does. But being careful in a debut is normal, and in no way was she abnormally cautious. And her Rose Adagio balances weren’t held quite as long as some others do – which begs the answer to the more important question: yes, she successfully completed them all. Where Lovette took this debut Aurora to another level was her timing, her phrasing, the nuances she already includes, and her ability to change her facial expression in seconds and to craft different reactions to each situation. She didn’t just portray a 16 year old cut from the pages of a fairytale storybook who also happens to dance exquisitely; she lived it, as a 16 year old might: instantly sizing up and reacting to each suitor, for example. And it wasn’t confined to the Rose Adagio. In the Vision scene, Lovette didn’t just do the steps. Rather than transmitting the usual beautiful but stoic image, she infused her dream portrayal with muted passion and temptation. And there is nothing “affected” about her portrayal. While not exactly an Aurora next door, Lovette is a natural as both teen and temptress, still able to convincingly combine a sense of innocence and irresistibility, as she has done since her first NYCB appearances. But it’s more than even that. As I’ve written before (in connection with her debut in a Rubies excerpt), there’s something in the way she moves. Her timing and stretched phrasing are components of a greater sense of musicality. She phrases and times so well not because she inordinately slows the pace, even to a minor extent; she just fits more in. The musical texture and pace set the framework, but she controls time, and plays with it, without in any way having to modify the tempo. The speed that Martins wanted is there, but the essential characterization and phrasing are there too. 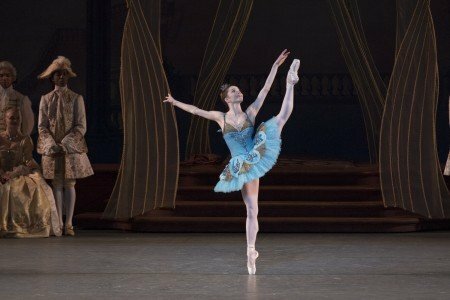 Most of NYCB principal ballerinas – indeed, all those who danced Aurora during these past two weeks whose performances I was unable to see – are highly musical. It goes with essential professional ballerina territory. But with Lovette it’s a little different. In one particular series, I watched her process of breathing – what I could see of it – in motion and still. There’s no sense of her catching her breath – it’s more preparation and acclimation. Lovette doesn’t just breathe oxygen; she inhales music. I spied Martins during intermission. Usually, when I observe him at a performance, he’s relatively stone-faced. This time, he was beaming – and I doubt it was for any other reason than that Lovette performed his version the way he knew she could, and the way he knew it could be. The tonnage didn’t just move, it soared. Lovette’s Aurora will continue to improve, as her comfort level increases, but the thought is almost scary. One wonders what Martins will come up with to challenge her next. Will NYCB eventually mount a production of Giselle? The respective Prince Desires, De Luz and Gonzalo Garcia, to me look more mature than the role suggests, which made their performances as a whole less believable. Admittedly, though, that’s my prejudice – in all roles in which age is a component, I prefer the casting to be, or at least to look, age appropriate. Aside from that, De Luz was animated and ardent, albeit somewhat hyperactive, and his partnering was superb in every respect. And his execution overall was dynamic and dramatic, with tours and perfect fifth landings that were clean as a whistle. Garcia lacked De Luz’s polish in execution, and, despite Lovette’s goo-goo eyes, was less credible to me as a love interest. And he came close to blowing the first of the Grand Pas fish dives. [I don’t know the cause, perhaps Lovette was slightly off the mark. 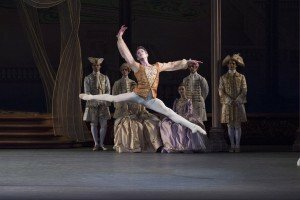 It didn’t look that way, but if so, as with partnered pirouettes, it’s his job to correct things and make his ballerina look good.] But generally his performance was more than adequate. As I mentioned at the outset, these performances – indeed, the entire week’s performances, were noteworthy for debuts – and I only saw a fraction of them. Last week, Sara Mearns assayed Carabosse, and her debut was marked by exceptional attention to mime detail and precise execution, although her acting wasn’t quite as exaggerated as I would like. And her portrayal was more “top down” than “bottom up.” By that I mean that her Carabosse was to the castle born: a high class fairy who somehow landed on the dark side. Gretchen Smith’s Carabosse on the 16th was from the wrong side of the fairytale tracks from the outset, and her debut squeezed more character and color out of the role. But both portrayals were very well done given the limitations in the allotted choreography and stage time. Teresa Reichlen’s Lilac Fairy (not a debut) was every inch the queen of the fairies: commanding, compassionate, and confident, and she executed impeccably. Miriam Miller’s debut in the role on the 16th was equally well-executed, but with more deliberation than was warranted in an apparent effort to get all the steps and mime in, and to get it all right, which she did. But her demeanor was a bit cardboardy, with little variation in expression or presence (for example, her head seemed always to be maintained at the same angle). Then again, the result added an almost spiritual and timeless quality to her portrayal, making it akin to a beatific and beneficent sculptured face fixed in time. In the February 9th performance, all the “secondary” fairies – the Fairies of Tenderness, Vivacity, Generosity, Eloquence, and Courage, danced respectively by Emilie Gerrity, Alston Macgill, Megan Johnson, Sarah Villwock, and Alexa Maxwell – were role debuts. On the 16th, Villwock and Maxwell reprised their roles, and the others were assumed by Megan LeCrone, Sara Adams, and Claire Kretzschmar. Although the universally exaggerated-looking, almost flyaway arms was somewhat off-putting, all danced their roles well, with Adams and Maxwell a fairy’s breath more dynamic, and Johnson adding a needed touch of serenity. In Act II’s wedding divertissements, Claire Von Enck (in her role debut) and Devin Alberda executed well on the 9th, but even better on the 16th. Both casts of Gold, Diamond, Emerald and Ruby danced superbly in their roles, with Anthony Huxley sensational in his debut on the 9th, partnered with Ashley Hod (who delivered a perfectly executed but somewhat colorless Diamond in her debut), and with Adams and Ashley Laracey performing gem-like Emerald and Ruby. Russell Janzen’s debut as Gold on the 16th was competent, but overly cautious. Emily Kikta’s Diamond debut at the same performance, however, was executed with all the sparkle the role requires, and Unity Phelan’s debut as Emerald was conveyed with the crystalline clarity that one has come to expect from her. Erica Pereira’s Ruby was also finely danced. On the 9th, Brittany Pollack and Daniel Ulbricht delivered a worthy Bluebird pas de deux (neither a debut). But the Bluebird pas de deux on the 16th, with Fairchild and Spartak Hoxha in his debut, was quite spectacular. Hoxha is an idiosyncratic dancer who I’ve mentioned previously. His utility may be limited, but he flew through his role here, achieving extraordinary ballon in the process. And Fairchild deserves a medal – not just for another excellent outing, but for providing support to her novice Bluebird as well as graciously playing second-fiddle on Lovette’s night. The gorgeous Balanchine-choreographed Garland Waltz is always a sight for celebration, with its seeming cast of thousands, including 16 young dancers from the School of American Ballet. And Zoe Feigelson (an SAB student), partnered by Alec Knight on the 9th (in his role debut) and Peter Walker on the 16th (who debuted the previous week) as Little Red Riding Hood and the Wolf, was both enchanting and spot-on – well deserving of the loud applause she received during the curtain calls. Finally, I must acknowledge the sets and costumes, and the NYCB orchestra. The scenery by David Mitchell consists largely of projected images. It sets the mood perfectly, without sacrificing any of the sense of fairytale awe and wonder that more elaborate (and expensive) sets provide. And the costumes designed by Patricia Zipprodt, while not as elaborate as those in other productions, make for a more coherent and dramatic (rather than curious or quaint) presentation than in other productions that attempt “authenticity” but can look ludicrous to contemporary eyes. The extraordinary NYCB orchestra (conducted on the 9th by Daniel Capps and on the 16th by Andrews Sill) is easy to take for granted, but it shouldn’t be. Despite the accelerated NYCB tempo, no musical nuance is lost. On the contrary, musical phrases that can sound muddy and dissonant in other productions come across here as clearly and distinctly as Tchaikovsky must have intended. 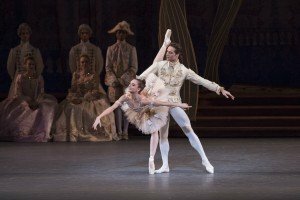 Although the orchestra is not the reason most people go to ballet performances, with NYCB, one is tempted – briefly – to close one’s eyes and just listen. Sometimes, if I close my eyes before a performance begins, I can hear in my mind the NYCB orchestra playing the score from…Giselle.